New Jersey has statewide online and land-based sports wagering, the bulk of which launched relatively shortly after the US Supreme Court finally overturned the federal sports wagering ban, PASPA, in May 2018. All of the major Atlantic City casinos launched their own physical sportsbooks within the 2018 calendar year, as did two of NJ’s three racetrack venues, Monmouth Park and The Meadowlands. The only operational, licensed facility to abstain was Freehold Raceway. This abstention from sports wagering isn’t permanent, of course, and is largely due to various partnership and logistical issues. Fortunately, all those delays seem to be worked out, with Freehold Raceway in central New Jersey (in the city of Freehold, naturally) finally looking to open their sports betting lounge in the near future. The track has all the necessary licenses to offer sports betting, and it is simply vetting the final batch of potential vendors that will offer the actual bookmaking services on-site. When Did The Freehold Raceway Sportsbook Launch? The Freehold Raceway sportsbook has not launched yet, though a 2019 launch seems likely. What’s more, in learning from last year’s delays across the industry (and across America), it seems a foregone conclusion that the Freehold betting lounge will be up and running before the start of the 2019-2020 NFL season on September 5th. From a legal perspective, there is nothing holding the Freehold Raceway back from offering sports wagering ASAP. 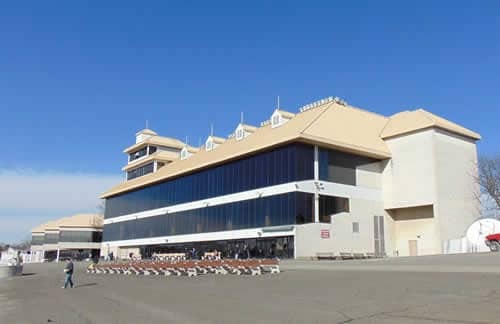 They have the necessary licenses and permissions from the appropriate governing bodies, and NJ residents are eager to place their wagers at this classic venue. Co-owned by Penn National Gaming, the Freehold venue already has a small degree of familiarity with sports wagering and the processes involved in setting up and operating a successful book. This, in New Jersey, means having an attractive, inviting sports betting lounge on the venue premises, but it also means rolling out a well-crafted, accessible mobile sportsbook. Where Is The Freehold Raceway Sportsbook Located? The Freehold Raceway sportsbook’s final location on the physical premises remains unknown, but you can expect it to be on the main floor, likely utilizing the same ticket windows as Freehold’s racebook product. Kiosks scattered throughout the venue are an additional possibility. However, you can also expect at least some portion of the existing floor to be remodeled and outfitted with all the bells and whistles that sports betting fans insist upon. Given the Freehold sportsbook’s local competition (Monmouth Park is just 30 minutes away), that means you’re likely to get big-screen HDTVs, a video wall, and plush lounge seating at the very least. Tableside food and drink service is also likely on tap, making the Freehold sportsbook a great place to not only bet on the game but to watch it as well. More generally, the Freehold Raceway itself is located just a short walk from the Freehold Raceway Mall. This mall is one of the largest and most popular shopping centers in New Jersey, and it gives the Freehold racing and sports wagering venue an immediate edge compared to other tracks. The Freehold Raceway Mall is ranked as the 25th most visited mall in the US, attracting roughly 12 million annual visitors to its 200 shops and restaurants. If even a fraction of those visitors pop over to the track and place a few sports wagers, the Freehold book will be sitting pretty. The synergistic opportunities at play are almost infinite. How Old Do I Need To Be To Bet At The Freehold Raceway Sportsbook? In order to wager at the Freehold Raceway sportsbook, you’re going to have to meet New Jersey’s 21-year-old minimum. As this is a state law, there are no workarounds or exceptions. That said, keep in mind that legal offshore sportsbooks will allow you to sign up and start betting on your favorite players and teams at just 18 years of age. However, these sites also ask that you defer to any local laws on the subject. Most states do not yet have legal sports wagering ages on their books, but NJ does, so deferring to this is your best bet. Does The Freehold Raceway Sportsbook Offer Full-Service Sports Betting? The Freehold Raceway sportsbook will offer full-service sports betting when it launches later in 2019. This is only called “single-game” or “Vegas-style” sports betting, which is a fancy way of saying that you can pretty much bet on any aspect of the game you like. You can place straight wagers (moneylines, spreads, totals) and parlays alike, and there are plenty of futures bets on the boards for all the major national and international sports. Given its American audience, the Freehold sportsbook will obviously provide the most action and live betting opportunities on marquee NFL, MLB, NBA, NHL, and NCAA games, but you can also bet on international favorites like rugby, soccer, tennis, cricket, golf, and more. As with all New Jersey sportsbooks, there are a couple of things that the Freehold Raceway book will never be allowed to offer (at least under the current laws governing sports betting in the Garden State): You cannot wager on NCAA teams from NJ (i.e. the Rutgers Scarlet Knights, the Princeton Tigers, or the Seton Hall Pirates), and you cannot wager on any NCAA matchups that take place inside NJ borders. If you’re a local college sports homer living in New Jersey, you’ll have to either drive to a neighboring state to place your bets or opt for a legal offshore sportsbook that offers action on your favorite amateur teams. Mobile wagering is definitely coming to the Freehold Raceway sportsbook, though the chosen service provider remains unknown. However, when it launches, you can expect mobile betting to be a huge part of the Freehold track’s business going forward. To date, mobile betting has accounted for between 75% and 80% of monthly sports wagering revenues, which makes sense. After all, mobile betting is far more convenient for far more people than visiting a sports betting lounge in person every time they want to place a bet. Live betting is definitely going to be offered at the Freehold Raceway sportsbook, likely in the form of rapid-processing betting terminals that do not require ticketing employees or cashiers. These self-service kiosks will allow bettors to wager on in-game events. This is handled by utilizing custom software that offers dynamically-adjusting lines and props that change on-the-fly while the games themselves are being played. There is no more engrossing or entertaining way to immerse yourself into the biggest games of the day than by participating in live betting. You’ll even be able to enjoy in-game wagering on your Freehold Raceway betting app at launch! Does the Freehold Raceway sportsbook have any special promotions? As a pure horse racing and horse betting venue, the Freehold Raceway does not offer any special promotions, at least not regularly. Remember, in New Jersey, the state’s three racetracks – of which the Freehold Raceway is one – are not racinos. There are no slots, table games, or anything else. With sports betting added to the menu, new promos might be offered, especially as the sporting seasons change, and they’re definitely going to be something to look out for. As it stands now, Freehold regulars get a no-nonsense venue where they can watch and wager on the ponies, have a few drinks, and enjoy a good meal. That said, there are never any entry fees for attending live races or events at the Freehold Raceway, and that policy will not change with the addition of its new sportsbook. Does the Freehold Raceway sportsbook offer a player’s card rewards platform? As with promotions, there are no player’s card rewards on offer at the Freehold Raceway. However, again as with promotions, sports bettors tend to expect these things more than horseplayers, so there’s a good chance that the Freehold Raceway experience will soon include valuable perks and rewards. If the racebook is going to be anything like other books in the state, you can expect rebates, points-based perks, cash-back perks, and perhaps even frequent-player rewards. This looks to be especially likely when it comes to mobile sports betting, and you can be sure that the Freehold Raceway mobile sportsbook will offer several system-wide offers you can take full advantage of just as soon as Internet-based Freehold Raceway betting launches. Does the Freehold Raceway sportsbook allow you to make parlay wagers? Yes, the Freehold sportsbook will definitely let you make parlay bets on all kinds of action. You will be able to combine multiple single-game or multi-game wagers within a given sport, and you’ll also be able to enjoy cross-sport parlays. There may be specific limits to consider (which will likely change depending on the time of year and what sports are in season), but these will always be communicated to you before you place your bets. All in all, parlays are one of the best ways to wager on sports, and you can really pad your bankroll by hitting on a strong ticket (especially one that features a few underdog victories).